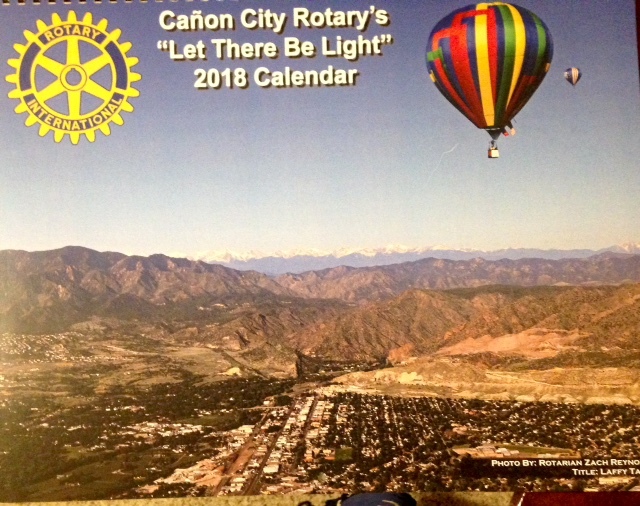 The Rotary Club of Cañon City Fremont County calendar for 2018 is now available, and proceeds received from calendar sales will be used to support the “Let There Be Light” scholarship and the Fallen Officers Scholarship Fund. The brainchild of Cañon City Rotarians Char Lindner and Jeff Mueller, the calendar project has supported the scholarship fund since 2009. The calendar features photos taken by Rotarians or family members and exhibits the beauty of our area. The scholarships are for first generation college students and benefit eligible graduates from Cañon City High School. Since the scholarship’s inception, it has awarded more than $75,000 to deserving students in Fremont County. Lindner, a retired teacher, initially approached Jeff Mueller about tax free ways to collect monies from her photography sales to use for scholarships. He encouraged her to join the Cañon City Rotary Club to utilize the Cañon City Rotary Foundation, a 501(c)(3) foundation. He also suggested that a calendar would be another great way to raise money. She became a member of the Cañon City Rotary Club, and the calendar project began. Char says, " The teacher in me cares about kids. These young people are academically qualified to further their education but lack the financial means. I strongly believe that this is a spirit inspired project, a way to shed new light on these kids’ lives and their futures. " The calendar is a cooperative effort between the Rotary Club of Cañon City and Colorado Correctional Industries (CCI). The CCI Print Services Department prints the calendars and a portion of the sales benefits the Fallen Officers Scholarship Fund. According to the CCI liaison, the calendar is one of the most popular projects that the female inmates work on. For obvious reasons, they don’t see much of the outdoors, and the beautiful photos give them a glimpse of Colorado’s natural beauty. Working in the print shop provides valuable work skills. He shared the success story of an inmate who will soon reenter society and has a print shop job waiting for her that pays $17.00 dollars an hour. To obtain a calendar and donate to this scholarship fund, see Jeff Mueller at Mueller & Associates, 303 N 7th St #100, or Lindner Chevrolet at 2805 Fremont Drive in Cañon City. Cash or checks are gratefully accepted. Checks should be made out to the “Let There Be Light Scholarship,” with calendar/s in the memo section. Founded in 1929, it is a service club comprised of members that represent all sectors of the business and civic community. Members share the Rotary vision of “Service Above Self” and are involved in service projects locally and around the world. The Rotary Club of Cañon City is part of Rotary International. For more information, go to the website of follow the club on Facebook.